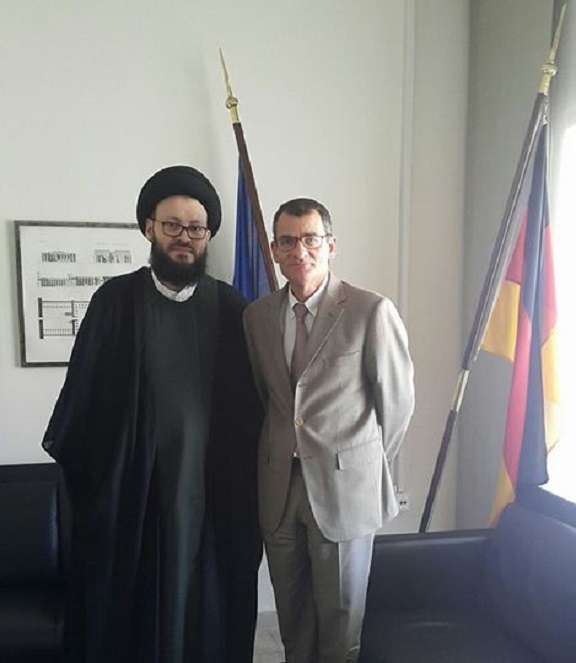 • الموضوع : Sayed Mohamad Ali El Husseini meets German ambassador and calls on his country to develop a positive speech with Muslims away from Islamophobia . Sayed Mohamed Ali El Husseini, called on Germany to develop a positive speech towards Islam and Muslims, and not to be satisfied with the security approach to the relationship with them. During his meeting with the German ambassador to Lebanon, Martin Huth, El Husseini thanked Germany for hosting the large number of Lebanese and Syrian refugees, in recognition of their humanitarian concern, in line with the moral and social role played by this great European country. El Husseini explained that Lebanon's survival outside the regional fire does not mean that it is immune. It is suffering from terrorism coming from behind the borders, internal tensions stemming from local causes, in addition to the Syrian refugee crisis and its great economic burdens on Lebanon. El Husseini touched upon a sensitive issue emerging in Europe, namely the infection of Islamophobia and the unjustifiable fear of Islam and Muslims. He stressed that Germany should formulate a positive speech towards this heavenly religion, which is open to all, in contrast to the purely security approach used by some Western countries In the relationship with Muslims. Sayed El Husseini said that Germany has taken a neutral stance on the Islamic-Islamic conflicts and is trying to push for a balanced policy to solve the Middle East crises, which will enable it to play a pivotal role at this critical stage.